The birthplace of Lord Buddha, the apostle of peace and non-violence. Still preserved, the broken Ashokan pillar, remnants of the old monastery and images of Buddha’s mother, Maya Devi. The auspicious garden of Lumbini is situated amidst the nearly established town of Siddharthanagar in the hot Terai plains of the west Nepal.The broken Ashokan pillar, holy remnants of the old Buddha’s Monastery, divine images of the Buddha’s Mother Great Maya Devi, etc are still well preserved here. It is built in modern style but there is the image of old Temple. Colorful Art has made it more wonderful and peaceful. This is the place where Lord Buddha was born. A stone representing a horse cause stone erected. Here you can see a big stone-slab located deep in sanctum sanctorum. The stone-slab foundation pinpoints the location of the original place, marking the precise spot of the birthplace of Lord Buddha. The place where Lord Buddha was given birth by her mother Maya Debi. Here she is seen supporting herself by holding on with her right hand to the branch of sal-tree, with the newly born infant Buddha standing upright on a lotus pedestals on an oval halo. Most people take it as Holy pool. Architecturally the pool has three projecting terraces in the ascending order and is revealed with a fine brick masonry. 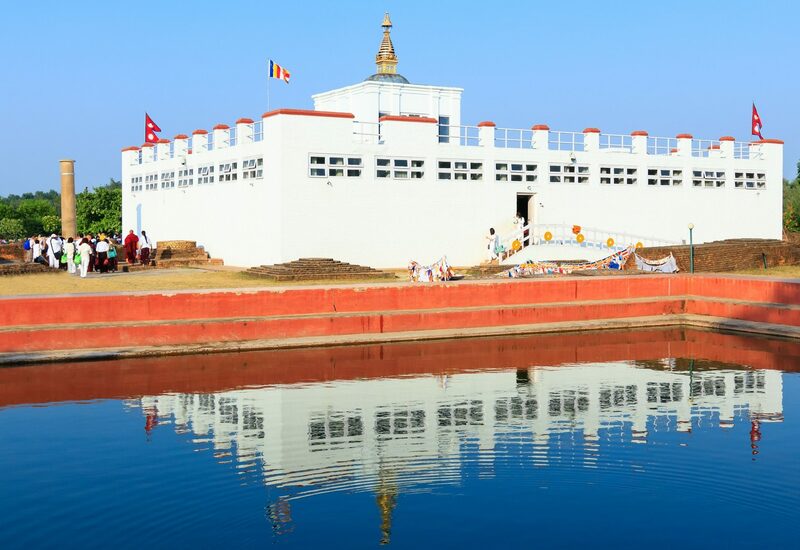 Kailbastu is believed to be the capital city of Lumbini in history. There are ruins and mounds of old stupas and monasteries made of kiln-burnt bricks and mortar. Seeing Kapilbastu, it could easily be visualized as a high seat of authentic culture. About 10 km north west of Toulihawa there is a rectangular fortified area, which is popularly known as Arorakot. The fortified area was identified by the famous Indian archaeologist as the natal town of Kanakmuni Buddha, remains of the old moat and the brick fortification around the kot can still be clearly located. Period while the virtual remains of the structures may be related to the early medieval times. In the village there exists an Ashokan pillar standing in a slab. The upper portion of Ashokan pillar is broken and lost and only the lower portion of the pillar 3.5meters high remains still intact. Kudan having a huge structure ruin with a cluster of four mounds and tanks. The mounds were excavatedin 1962 only. The site has a quadrangular tank surrounded by bushes, locally known as Niglisagar. On the western bank of the tank there appear two broken pieces of Ashokan pillar; the longer one laying flat and the shorter one stuck unto the ground. The ancient tank ruins, which were excavated and identified as “Palace of massacre of the Shakyas” in 1895,can still be located on the south west banks of sagar.